​ We are dedicated to improving patient outcomes by healing wounds, preventing re-occurrence, and providing education for patients and their families. at strategic intervals, performed by the Surgical Clinic physicians. by a registered nurse certified in Wound Care. 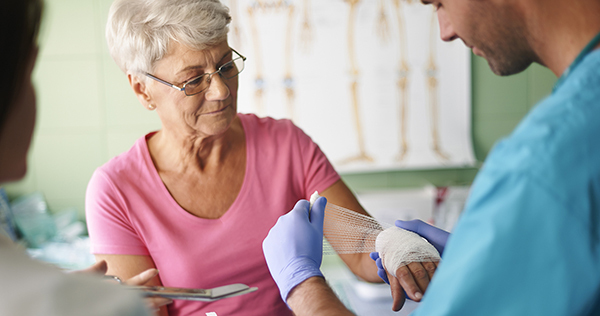 We look at the wound location, type, dimensions, and evaluate the wound and the skin surrounding it for any swelling, redness or circulation problems. including wound history, previous wound therapies, nutritional assessment, medical history, social history, review of physical examinations, assessments and treatment plans. for non-healing wounds, pressure ulcers, lower-extremity venous ulcers, arterial ulcers, neuropathic or diabetic ulcers, traumatic wounds and surgical wounds. about wound causes, relief factors, treatment options, skin and wound care instructions, proper nutrition and pressure-relieving measures. Coordination of supplies and follow through with home healthcare agencies as needed. Mon-Fri, 8 AM - 4:30 PM.